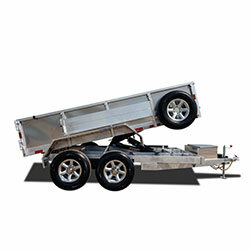 The Sundowner Utility Trailers are built with features designed to make work and play easy. 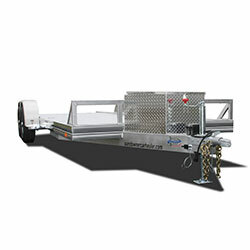 Options such as the bi-fold ramp and heavy duty ramp allow this utility trailer to be tailored to fit specific needs. 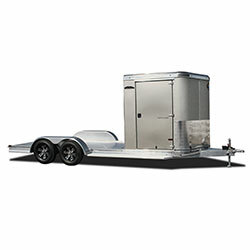 The MC12 utility trailer is the perfect design for hauling motorcycles. A protective air dam shields the bike from rock and road debris while the wheel chocks maintain the load position. 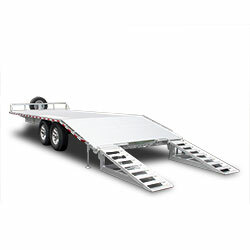 The 6’9” wide, 12’ long all aluminum trailer has a heavy duty 48” utility ramp with 2 treadplate ramp strips to ensure safe easy loading and unloading. An LED load light is mounted on the back of the 10” bump rail. 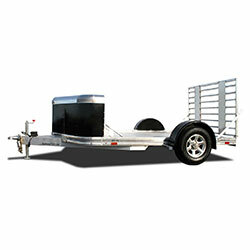 Sundowner’s versatile APU Trailer is an all aluminum durable trailer. The 6” channel frame, square nose with a 10” bump rail, 2” treated wood floor and diamond treadplate fenders make it both stylish and functional. 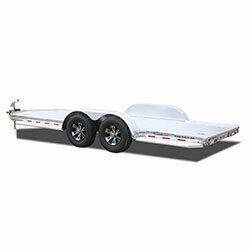 The All Purpose 9624 Utility Trailer has a sporty look, stylish features and is built tough. The 8’ wide all aluminum deck over trailer has stake pockets and a rub rail, a front bump rail, and an interlocking aluminum plank floor. It is well equipped with 5200 pound rubber torsion axles, electric brakes, stylish aluminum wheels, 15” nitrogen filled radial tires, clear lens LED lights, and a heavy duty adjustable coupler plus lots of available options. 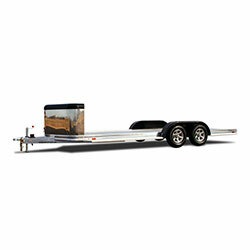 The 4000AP Utility Trailer provides the eye appeal of the open car hauler and the features of the utility trailer. Slide-in removable ramps, lockable tool box and 10” bump rail are two of the versatile features. The tough features on the XL DeckOver Series work well for hauling equipment, hay or feed, ATV’s, Side-by-Sides and rock crawlers. This gooseneck has a 2x6 treated wood floor on 12” I beam crossmembers. The dovetail has flip over heavy duty ramps for easy loading and the rub rail with stake pockets makes securing loads easy. 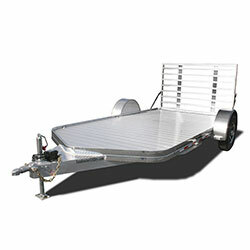 Sundowner’s Dump Trailer is a tough light weight all aluminum trailer loaded with features. Its heavy duty floor is .125 thick aluminum and the sides are .090. Loading ramps attach easily to the back and then mount on the sides for hauling. Two way swinging rear gates are standard with side hold backs. The self contained scissor hoist is a two stage, electric/hydraulic design. The lightweight, easy to maneuver Outdoorsman by Sundowner is a versatile solution to the hauling needs of an active lifestyle. Haul an ATV, lawn or work equipment, or a car behind an RV and keep gear, tools and personal items locked up safely in the front storage compartment. 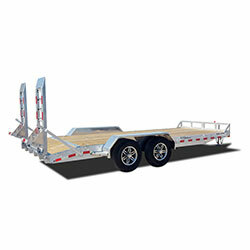 Showcase and deliver automobiles safely with Sundowner’s all aluminum 19’ Open Car Hauler. Both versatile and durable, it features removable slide in ramps, interlocking aluminum plank floor, polished extruded bottom rail and comes with LED lights, electric brakes and torsion axles. It’s the perfect blend for looks and quality features. 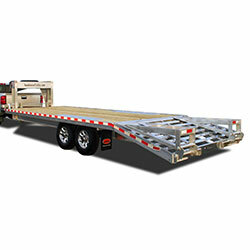 The Ultra Series is Sundowner’s 22’ Open Car Hauler with the most popular options added. While showcasing and safely hauling toys they are protected by a 3’ permanent enclosed storage compartment where vaulables can be stored under lock and key. Its stainless nose, custom paint and polished bottom rail provide added eye-appeal.